Under a northern sky, a young dairy maid of Haydon Bridge tended cattle right up to the ridge. She was kif – good, pretty and sweet. 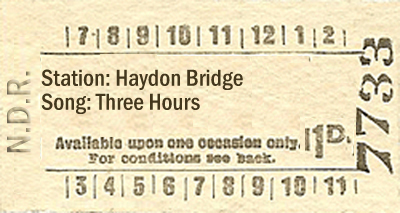 She had no jacket nor shoes for her cold little feet, but dreamed of a life with a stranger she would meet under the bridge at Haydon. Each night under the bridge they kissed. She filled his mouth with bread and meat. She quenched his thirst with milk and honey but always, at dawn, he left her, quite sunny, but with baskets bare, milk jugs drained and empty promises of a life with money. One day, while the cattle rested after their milking, she watched a tailor making a coat for her mistress. She watched and sighed; she with no jerkin, no bonnet nor petticoats neither, sighed. She with no shoes for her cold little feet, sighed. Thi bari morts, smart lasses they were, mean and stingy, housemaids they were, teased and mocked her for her stenshin, sleck and foul-smelling clarts. Oh, how her heart wanted a coat just like this: blee as the sky, bedighted with white eglantine and yellow pittleybeds, what the French call dents de lions, stitched from silky threads wound with silver and gold. Bumblors buzzed and dipped their stripy heads, their gossamer wings shining. Every morning and every evening, the dairy maid sauntered through the fields while calling her coos, howked the yarbs, daisies white and buttercups yellow, to tangle in her braided hair. She listened to spuggies cheap and dreamed of the stranger she’d meet and of a coat that would charm him. And when her milking was done and the coos turned out she went to tyek i deek, just a peek, at the tailor’s work. She pestered him so much with her blethorin’ and her longing that at length he made a bargain with her. Three hours from sundown, the dairy maid skipped up the hill to the aad church, her bargain to fill. She opened the yarkin’ big door stepping lightly, quickly over to the altar, where the red leather bound book lay glowing in the light of an eternal flame. As she was leaving, closing the heavy door behind her, the book swathed under her knitted shawl, she heard a gabbor, voices she thought, coming from the vestry door opposite the altar, at the western end of the church. Behind the door, kept open a crack, she peered into the nave. Two men she saw, dragging a woman’s body. Limp it was, draped in ruby. Her golden hair, a single plait, trailing over the tallest man’s arm. The girl, in rising terror, watched. The girl, her feet growing roots into the earth, watched the men lift the flagstones next to the font and roll the body into the hole beneath. For three hours the young woman waited, waited to be sure they had gone until dawn’s light, grey as doves’ wings, revealed grave tombstones. She shook herself awake and ran. But in her haste she tripped and fell over a “bowarrow”, which she recognised as that of her lover! The next night when he came to visit her, under the bridge at Haydon, under the arches on the river’s bank, ready to taste her bread and meat, eager to drink her milk and honey, willing and able to make good his promises of money, she showed him his bowarrow at which sight he trembled and despondently declared, “I bid you farewell, a long farewell”. So the young woman of Haydon Bridge, a dairy maid who tended the cattle right up to the ridge, who was kif, good and pretty, sweet with white daisies and yellow buttercups tangled in her braided hair, gained a new coat she could not afford and lost a man she should not have loved.